As always, it is better to use the downloaded code, rather than copying from the post, because the WordPress software changes quotes (“”) and several other characters, so that code copied and pasted from the post will often not run without editing. Transferring arrays between VBA and Fortran. Writing and compiling a simple Fortran function to solve quadratic equations, and linking to it from Excel. Compiling a Fortran function to solve cubic equations, and linking from Excel. The function parameters: qdat, ResA, and NumRows are declared as either intent(in) or intent(out); intent(inout) is also allowed. It is essential to ensure that both the data types and the sizes of arrays in the VBA and Fortran routines match. As for C++ dlls, array parameters are passed by reference by entering the first member of the array. Unlike C++, in Fortran the array members are named in the same way as VBA; i.e. ArrayName(Row No, Column No). The code includes one function that operates on one equation at a time, and two alternative array functions that provide much better performance by avoiding the transfer of data between the spreadsheet and VBA. For comparison VBA cubic functions are also included in the download file. 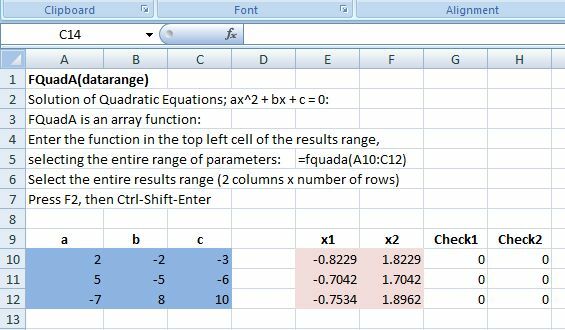 This entry was posted in Excel, Fortran, Link to dll, Maths, UDFs, Uncategorized, VBA and tagged Cubic, Excel, Fortran, Quadratic, UDF, VBA. Bookmark the permalink. If you read those and it still doesn’t work for you please post exactly what the problem is and I’ll see if I can help. Thanks alot for these posts about linking vba and Fortran, they have been an immense help. This site is a great resource!! Here is something that I learned that might be of help to others doing mixed language programming. If you want to package your dll’s along with your excel sheet and not worry about copying your files to a certain directory to maintain the paths to your subroutine calls, here’s what you can do. As long as your dll’s are in the same location as your spreadsheet you only have to call the dll name in the declare statement. Thanks Jason, I’ll have a closer look at that when I have time. The 2nd of two excellent articles. Just to note that with recent Silverfrost versions you cannot use the Check mode of Plato (it does not work), but code works fine with Release Win32. Nuno – I’m afraid I won’t have time to look into gfortran, but if you let me know exactly what problems you are having with the Silverfrost compiler I will see if I can help. Bill – thanks for comments. hey…is it possible to read the values from excel( more than 2000) in fortran perform operations on it and take the average of the intermediate values?? mmanu – I’m not exactly clear what you are wanting to do, but if you create variables in VBA and pass them to the Fortran code, you can then access the variables from VBA after they have been processed by the Fortran. The above DLL approach seems interesting but all I require is to write out an x/y array of data to a named excel workbook to utilise the excel graphics..can anyone help? Colin – I’m assuming your x/y array is in a Fortran routine. Probably the simplest thing would be to write the array to a text file, then have a macro in Excel to read the text file and plot the data. Alternatively if you are using 2007 or 2010 you could probably write the data to an Excel file in the new format, but I haven’t looked into that. Finally you could do it with a dll set up to work with Excel, which would be more work, but you could set the whole thing up to use Excel as the pre and post processor, without needing to keep track of text files. I am totally okay to pass 1D arrays but when it comes to 2D arrays the excel crashes. I do not know why. I am using Excel 2007. Recently downloaded Excel 2010 but nothing changed it still crashes with 2D arrays. I think I found the problem, you should build the dll with Release Win 32 option selected at the PLATO of silverfrost. default is checkmate 32. Now it is working. anyway welcome to other comments as well. mollam – I didn’t have the same problem with 2D arrays with Checkmate 32; I wonder if you changed something else between the two compilations? Anyway, the Release Win 32 is the appropriate option for the final compilation, after you have finished debugging. no I did not change anything. but thanks mentioning though. hope will help somebody in trouble with dlls. I found by trial and error, VBA is really unforgiving, unhelpful when calling fortran dlls. when compiling if you use optimization options then you can really get amazing results. for gauss elimination (operating on symmetric banded matrix in rectangular form) section of my code I got almost 50 times speedup. really amazing. so I am thinking what is the problem with VBA numerical performance why it is so inferior I mean 50 times like day and night..
dim K(),F() as double will dimension F() as a double, but K() as a variant. You have to specify the data type for every variable, even if they are all intended to be the same. You are right about it being unforgiving using VBA with dlls (applies to c++ as well). Every variable passed between VBA and the dll must be the same data type, and if you try and write outside the bounds of an array it usually causes an immediate crash. As for speed, yes for maths intensive things like Gaussian elimination linking to a compiled dll will give a huge speedup, but 50 times sounds on the high side. Are you working with an array of doubles in the VBA? Using a range really slows things down. himm thanks… that should be the case then, anyway there should be away for debugging this dll mixed programming. have you ever tried this? BTW although very convenient and clear for dll the silverfrost does not support parallel processing as my understanding. it would be great if it was doing so.. dougaj4 as I see you are also doing lots of numerical simulations, have you ever construct dlls in fortran or c/c++ running on multiple CPUs and call them from VBA as usual? mollam – I can’t be a lot of help with your questions I’m afraid. I haven’t managed to get a smooth debugging process working, although I think it should be possible. The only advice I can give is that if you have unexplained crashes happening check the data type and array size of everything being passed btween the VBA and the dll. as the first thing to look at. I haven’t done anything with multiple CPUs either, but as long as all the logic for handling that part was in the compiled code I can’t see why it wouldn’t work. Pingback: ¿Cómo utilizar programas en Fortran desde Excel?